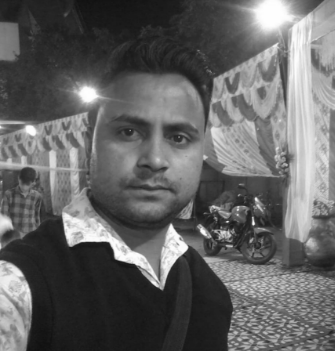 Purdilnagar, is a small town located in the Hathras district of Uttar Pradesh in India. It is a glass bead and bangle making craft cluster. It is hardly 80 km from Agra, the largest tourist attraction of the country. The glass beads and bangles being crafted by thousands of hands in this town are globally recognized for its highly skilled craftsmanship, however lesser known in the country itself.The bead making process is spread across 100 km in and around Purdilnagar. Ishtiyaqe Ji has been practicing the craft of glass bead and bangle making for almost 27 years and this is the single source of earning. He has been making the glass beads and bangles at his setup located in a small town called Purdilnagar. He has learnt the skills of this craft from the elders in the family, a common scenario in any community based craft practice of India. 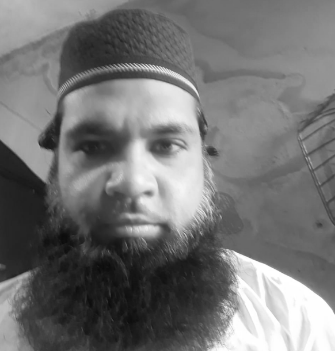 Ali Muhammad is a young 24 year old artisan earning his livelihood through the practice of furnace made glass beads and bangles at his setup located in a small town called Purdilnagar. He has learnt the skills of this craft from the elders in the family, a common scenario in any community based craft practice of India. Small-dark-curio ateliers, furnaces, table set-up lampworking, chip work, bead washing, frosting, lustering and silver coating, and working with metal molds –this five day workshop will be engaging, challenging and exciting to explore the medium of glass through this traditional method of bead-making. It will introduce the participant with the different bead forms and finishes possible along the line. This workshop will not limit but offer one to explore more possibilities in the dimension through this medium of forming glass. Gary was born in London, the UK, in 1958 and immigrated to Australia in 1973. He started working at Courtland’s pottery in 1974 and began his learning’s from Barry and Grenville Courtland. Courtland’s produced a large range of Terracotta Garden Pottery in its earlier years including salt glazed stoneware. Gary considers himself to be the lucky few to have successfully completed training at Courtland’s. The training helped him to learn the secrets of the family business which have been passed down over the last 160 years in Australia. In 1979 Gary started work at Austware pottery and made stoneware until September 1985, when he was asked to be the resident potter at the Old Cheese Factory in Balingup. Over the next three years Gary developed his own style of work. The Old Stables Pottery “My own pottery”was built by Gary in 1989 where a wide range of domestic stoneware and one-off pieces were made until 2004. He then decided to move to the hills in Nepal . There he spent time working with potters in remote villages and learning how pots were made using primitive technology, for the last many centuries, “Amazing”. Gary loves his work and hopes that you will too. On one of his trips back to Australia, Gary spent the summers working at Happs Pottery. In 2010 he moved back to Australia to start again. He is now working from a studio in Capel, Western Australia. 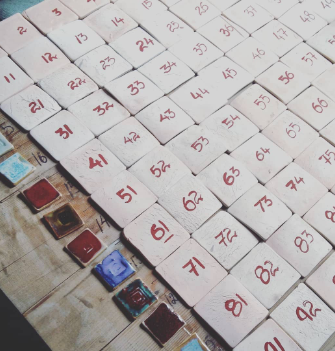 Gary specializes in high temperature reduction firings (cone 11) with copper reds, Chun Ware and Jun glazes. Earlier, he used to work with stoneware using slips and oxides as under glaze decoration. Most of the decorations were done while the pot was still wet on the wheel. Gradually Gary was successful in creating his own pallet that is used to this day. With years of experimentation and fine tuning the kiln design has been tweaked for maximum efficiency. 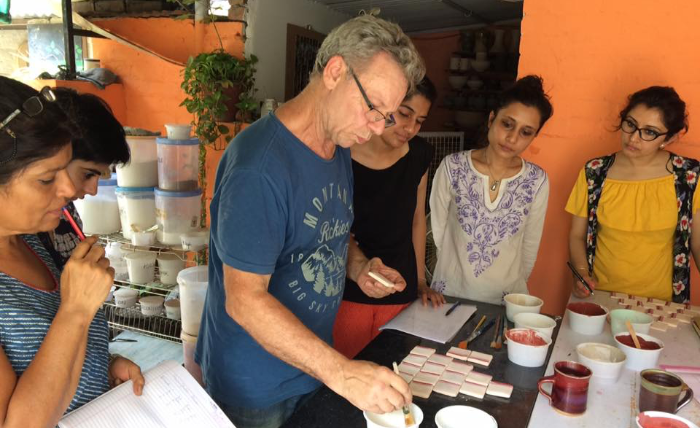 Since January 2015 Gary has been conducting glaze development workshops and is also teaching pottery from RedMug Studio in Chandigarh, India. 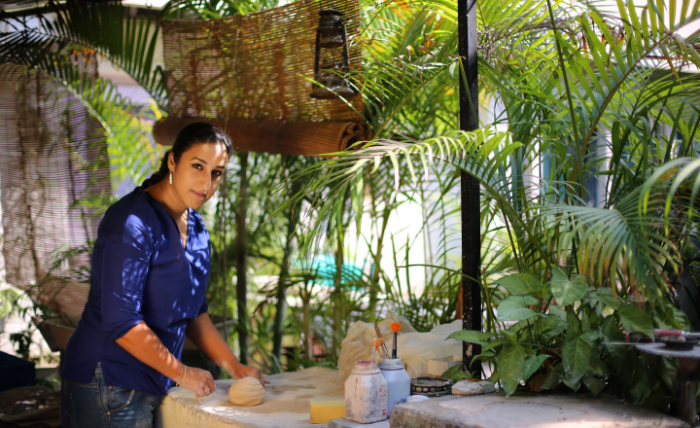 After completing the course, she joined a ceramic studio in Pune to gain first-hand knowledge of various production techniques and best practices. It was there Japneet truly experienced the essence of pottery studio, with Ruby Jhunjhunwala as her mentor.She set up a small studio in 2007 to work on those improbable things that often make their appearances on the pottery wheel. It was a time of intense introspection when she learned the possibilities and limits of clay and glass. She went on to establish a more formal studio in 2010, with a space for people to explore the materials and learn. Japneet developed programmes and workshops in her studio to help people explore the wonderful mediums of glass and ceramics. But the progression of her workshops was not skill-based or course-based. It was designed to introduce people to this wonderful, tactile and often quirky medium. You learn along the way that as you mold clay, clay molds you. Red Mug is the next stage of the journey. Alongside, Japneet also conducts Material and method courses for ceramic students at NID-Ahmedabad ,NID-Kurukshetra and IICD Jaipur. A natural teacher, she shares her creativity with students at her home studio, redmug.in. Since 2015, Japneet has been spending a few months at Happs gallery Western Australia as a resident ceramic artist. She has also help set up studios for her students in Chandigarh and proudly introduces them as her support team mates. 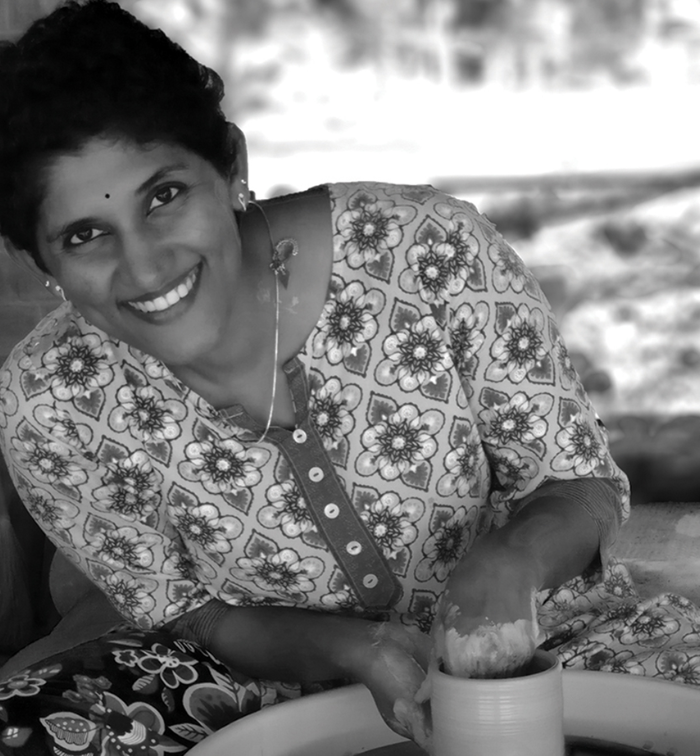 Growing up with a creative and supportive family, Kaveri found her way very naturally into clay around 1995, and has remained with it, since.A short stint, in Chennai, under Hans Kaushik, and then under Padma Rajagopal in Studio Alpha near Mysore, made her realize that she had indeed found her calling in clay. She had a total immersion in clay work in 1996 and 1997 learning pottery under Ray Meeker at the Golden Bridge Pottery, (GBP), in Pondicherry, India, where she got a strong foundation in wheel thrown pottery, and wood fired kilns. After a year of teaching pottery in Sishya, a school in her hometown, Chennai, and conducting workshops for adults and children around the city, she was offered an opportunity to work as Studio Assistant and Teaching Assistant to Ray, at GBP, in 1999, and also work as workshop assistant for workshops conducted by Jane Perryman and Mike Dodd, in late 1999, and early 2000, respectively. Since then, as she slowly set up her own small, one room studio in the city, over the next several years, or even while she worked with Entertainment Education with an NGO working with women and children from economically backward communities, she has kept in touch with clay by teaching it through regular classes or short term workshops. Kaveri has built kilns and set up Ceramic Centres for other organizations and also shown her own work in a few group shows. She has worked for art, craft and heritage centres, as well as galleries, conducting workshops and helping develop their infrastructure, facilities, and repertoire. Since 2013, Kaveri has been visiting faculty at NID. 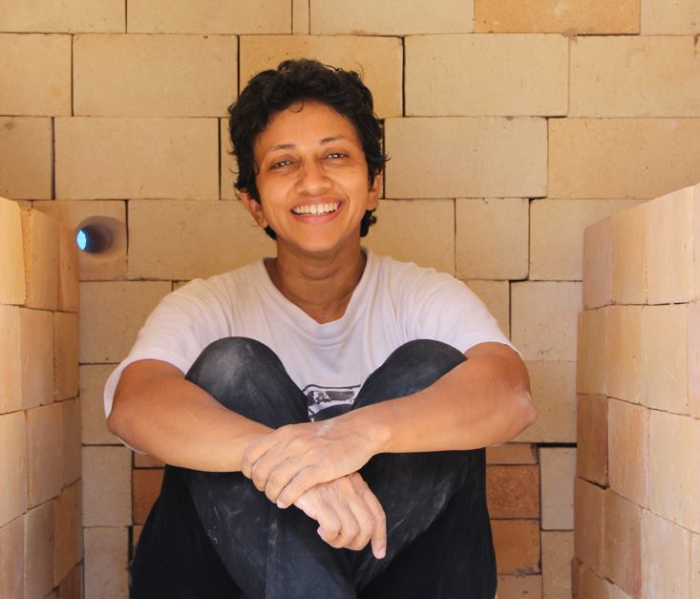 In March 2014, Kaveri launched her own 45 day long, crowdfunding campaign to realize her dream of having a wood fired Soda Kiln. The campaign on the Wishberry platform succeeded, and she now has India’s first, (and as yet, only) Crowdfunded Kiln, at a farm on there outskirts of Chennai, that she has named, Pothole at The Farm. 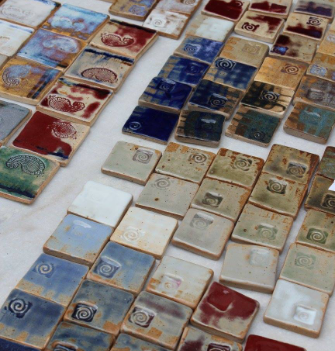 The kiln building workshop, will be a short, but intensive, hands on workshop, over 5 days. The arch frame, mortar, and bricks will be made ready in advance. The participants will get a quick introduction to what a kiln is, and the basic principles of kiln design and materials. After that, with plans in hand, they get to building the kiln, loading it with pieces, and then firing it with wood. Sushma Anand completed her B. A. Fine Arts from Stella Maris College, Chennai in 1997. She continued to explore her creative skills and learn Basic Ceramic from the Regional Design and Development Centre, Bangalore. It was under the tutorship of Ray Meeker, Deborah Smith and Amrita Dhawan at Golden Bridge Pottery, Pondicherry and Kodaikanal through 1999-2000 that Sushma completely lead herself into the practice of pottery and ceramic. Since 1999 till 2017, Sushma has attended several workshops, ranging from “Pit-fired Pottery” offered by Jane Perryman, “Thrown forms and Ash Glazing”, offered by Mike Dodd, , “Letting Go” offered by Sandy Brown, “Glazed Terra Cotta” offered by Betty Woodman at Golden Bridge Pottery, Pondicherry. While, “Understanding Glazes” offered by Sandeep Manchekar and “Reduction Glazes and firing”, offered by Gary Hambilton at Klay Karma, Banglaore. These workshops supported her queries and journey into variety of skill sets and expressions the material provides. Accomplishments by her side range from teaching at Golden Bridge Pottery, setting up ‘Kalaakaar Potteries’ with her fellow potters, working for Tata Ceramics to contribute towards surface development. She continues to offer workshops on “Print on Clay”at various institutes and places, including Mandala Pottery, Rekha Bajpe’s Studio, Delhi: Tejashri Patil’s Studio, Mumbai; Nalini Thayagarajan’s Studio, Klay Karma, Bangalore; Kaveri’s Studio, Chennai. She has also exhibited at “Containers” at Triveni Kala Sanga, Delhi; Interior Expo under the banner of ‘Kalaakaar’ at Chennai Trade Center, Chennai; DBS Gallery, Chennai; “21 Carriers” at Gallery 25, New Delhi. Solo Show; Group exhibition at Kodaikanal; “Apposite Possibilities” Ceramic show at Vernissage Gallery, Cochin; “Bridges” group show at the Stainless Gallery, Delhi; “Porcelain Show” at Habitat Center, Delhi; “In to the Box” at Amber Fort, Jaipur, during the Ceramics Triennale. Besides practicing pottery and offering workshops across the country, at present Sushma also teaches as Art and Design faculty (IGCSE) at GPS International School and currently also heads the department. Print on clay is an alternative method of surface decoration. It is the ability to transfer drawings and pre-printed matter from another medium like paper, cloth or plaster of paris on to clay. The workshop will cover a variety of techniques using slips and underglazes (ranging from mono-printing including tissue transfer and photo lithography to screen-printing) as well as making your own screens for printing. Unlike decals which are applied to the surface of the ware as a last firing, the applications of these techniques are suitable for wheel-thrown and slab-built forms and other manipulated forms. It also provides the user an opportunity to use a wide range of colours and firing temperatures. The glaze workshop is spread over five days intends to cover the basic of formulating a base glaze for high temperature stoneware body. 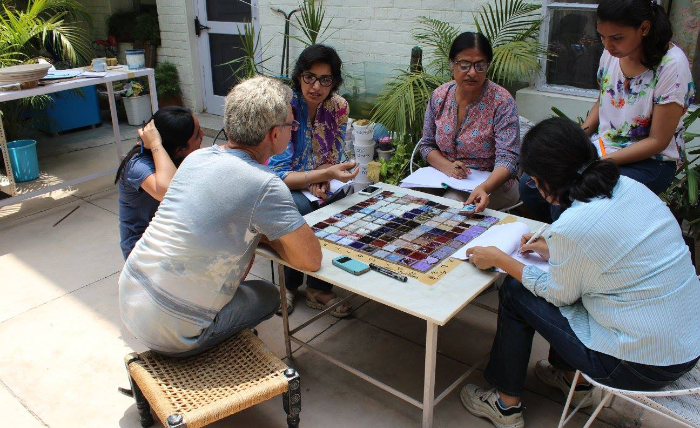 The participants will be introduced to line blends, tri-axial blends, over and under glaze palette during this course of five days. Not only the results will be discussed during the workshop but the participants will be taught to tweak the recipes to gain a desired result after understanding its behaviour.